More than 80,000 personnel, about 1,000 tanks and armoured vehicles, 130 long-range, fighter, bombing and army planes and helicopters, as well as 70 naval ships and vessels, take part in drill. At midnight Moscow time on Saturday, July 13, troops of the Eastern Military District were put on alert. This means that all leave for officers, NCOs and other members of the Armed Forces under contract has been cancelled and conscripted soldiers and sergeants are not allowed furlough to go to town. Ammunition has been put into tanks, armoured vehicles, self-propelled guns, anti-aircraft missiles and tactical missile launchers. All this hardware, along with the personnel, has been moved out of military parks to areas of concentration, proving and shooting ranges, have taken their assigned positions, camouflaged themselves and, with engines turned off, are waiting for further orders. Fighters and bombers have left their airfields and are waiting for further orders at standby airfields. Pacific Fleet ships have put to sea. The Eastern Military District is several times the size of France, stretching from Lake Baikal to the Pacific and from the North Korean border to the Arctic Ocean. The Russian Defence Ministry press service has announced that more than 80,000 personnel, about 1,000 tanks and armoured vehicles, 130 long-range, fighter, bombing and army planes and helicopters, as well as 70 naval ships and vessels, are involved. They have all been put on alert on the orders of Supreme Armed Forces Commander-in-Chief Vladimir Putin, who, during a visit to Kursk the day before, ordered Russia’s Defence Minister Army General Shoigu to conduct a challenge inspection of the Eastern Military District. Similar inspections of the Western, Southern and Central Military Districts have already been carried out. Some of the district’s units will be moved by air, rail and sea over a distance of 3,000 kilometres, while the enemy will be played by the units of the Central Military District (its area stretches from the Volga River to Lake Baikal), specifically by the Novosibirsk Combined Arms army, with attached fighter and bombing aviation. The inspection will also involve manoeuvres by Pacific Fleet surface ships and submarines, marines and other troops. The challenge inspections are not connected with any real military threat to Russia. Indeed, it has been officially stated that they are not aimed against any other country. It has nothing to do, as some might think, with US citizen Edward Snowden marooned in the Sheremetyevo airport transit area, who had earlier asked for political asylum in Russia. Russia is not going to fight anyone and is not threatening anyone or showing its military muscle: those who are supposed to know in the neighbouring countries and even on the other side of the world are well aware of this. Sudden alerts for troops in a military district or arm of the service are the most effective way of testing the real and not declared combat readiness, the commanders’ ability to control their units and solve combat tasks that crop up. 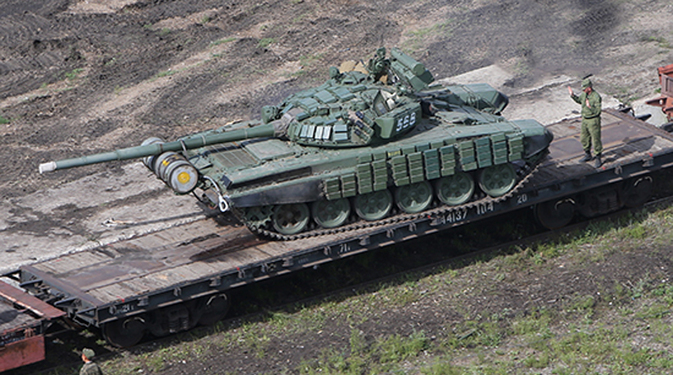 For example, the surprise inspection of the Central Military District and some Airborne Troops units in February on the order of the Defence Minister – for the first time in the last twenty-odd years – revealed that some units were unable to deploy their fighting vehicles because some of them, notably those recently repaired at defence industry enterprises, got stuck halfway. Some units did not even receive the alarm signal from Moscow because the officers on duty slept through it. The phone call from the Russian capital to the 201st military base stationed in Tajikistan never came through. It turned out that telephone communications with the Russian base were organised through the Republic’s Communications Ministry, which was not overly concerned about its stability and accuracy. All these drawbacks had to be urgently remedied. The chances are nobody would have been aware of them had it not been for the unscheduled combat readiness check initiated by Minister Shoigu. The inspection of the Southern Military District also revealed shortcomings in the way communications and control were organised, as the President noted during his meeting with the Defence Minister. Similar derelictions were found during the inspection of the Western Military Districts. They, too, are being rectified. That is not to say that all the shortcomings of the military reform will be eliminated by means of unscheduled inspections alone. Far from it. Modernisation and building of the Armed Forces is proceeding in line with a detailed plan up to the year 2020, as witnessed by the plan for developing the army and navy for the coming ten years recently published on the Internet. But plans are just plans, even if their implementation can be monitored on-line. The real combat readiness of the troops is checked if not in war, then certainly in the field, at sea or in the sky during exercises and manoeuvres. This year has seen a fair number of them and will see many more. The military say 1700 checks of combat readiness are to be carried out. The alert in the Eastern Military District is just one of them. There will also be a major operational-strategic exercise, West-2013, in Russia and Belarus in September, launches of strategic land and sea missiles (the Sevmash shipyard is to deliver to the Russian Navy two missile-carrying Borei-class Project 955 strategic submarine cruisers, each carrying 16 Bulava strategic missiles). Long-range aviation will fly across the Atlantic and the Pacific and all four fleets will approach the Mediterranean, the Atlantic, Pacific and Indian oceans. To repeat, all this is being done not to intimidate anyone (incidentally, NATO regularly conducts troop manoeuvres near the Russian border) but solely to upgrade the skills of Russian officers and military staff in controlling the troops, to hone the skills of tankmen, artillery men, infantry, airmen, seamen, the Aerospace Defence troops and operators of various combat systems. The army of any country must be ready at any time to repel an attack by any aggressor. To be able to do that, it must be in constant training, like a football team. This will be the task over the next week of the Eastern Military District troops and the Pacific Fleet under its command.